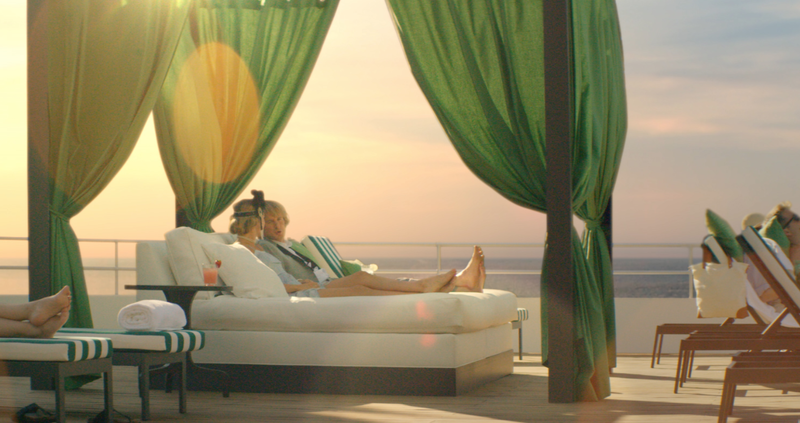 P&O Cruises has teamed up with Hollywood star Owen Wilson to showcase its two latest ships - Pacific Aria and Pacific Eden - which will join the cruise line’s fleet in November this year. Josie's Juice spotted a preview of the ads a few days ago, and was kinda sold with the clever new collab. Owen, famed for his roles in 'Zoolander', 'Meet The Parents', and 'Wedding Crashers' is the star of three short films, titled 'The Conspicuous Awakening of Owen Wilson'. Directed by Tom Dey ('Shanghai Noon', 'Failure to Launch'), each film shows Wilson enjoying the ships’ great features, through a series of dream-like and humorous flashbacks. Each instalment is set against a backdrop of some of the key features on both ships, opening in The Blue Room – an opulent and intimate space with rich velvet and chrome furnishings. Playing everything from Funk to Blues and Jazz to R 'n' B, it will be the live music hub of the ships. Films one and two launched earlier this week at www.befreeowen.com.au, and the third and final film was also then released this week. The campaign was developed with P&O’s advertising partner, BMF. P&O Cruises Senior Vice President Sture Myrmell said the cruise line’s latest ships had been inspired by modern Australia, with their resort-like styling and new look making them game changers for the local cruise industry. And visit www.befreeowen.com to view The Conspicuous Awakening of Owen Wilson. It's the region’s largest and longest-serving cruise operator, and leads the way in cruising as Australasia's only 'home brand' and its favourite cruise line. P&O Cruises has been sailing the region for more than 80 years (wow), and has pioneered new destinations around Australia, the Pacific and Asia including Papua New Guinea, as reported in the New York Times’ 52 top destinations for 2015. On November 25, 2015, P&O Cruises will welcome two additional ships to its current three-ship fleet becoming the nation’s largest cruise line with five ships cruising from eight home ports in Australia, New Zealand and Singapore. The addition of Pacific Aria and Pacific Eden has paved the way for exciting new cruise options including deployments from every mainland state in Australia and an extended deployment from Auckland. The pair herald a new era for P&O Cruises, as reflected in its new brand repositioning - P&O Cruises, Like no Place on Earth. Below is the pic that got me wistfully wanting to experience a cruise ASAP - that's right, I am yet to experience a cruise. This has convinced me to take the family on one this summer! The short-film trilogy comes ahead of the launch of Pacific Aria & Pacific Eden on Sydney Harbour on November 25 – with a massive five ship extravaganza featuring Jessica Mauboy. Bring it.